Before the big blaze, San Pedro police with help from Belize City conducted operation Clear Water in San Pedro over the weekend. 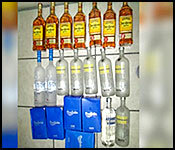 On the morning of Friday July 4th, Special Branch intelligence led police to a residence in the North San Pedro Area where they found a stash of contraband, namely (5) Quarts Don Julio,(7) Litre Absolute Vodka,(2) Litre Grey Goose Vodka, and (7) litres Jose Cuervo. Two men, namely 27 year old Samuel Cruz and 24 year old Iliana Leticia Cob were handed over to Customs. An out of court settlement was made and Cruz 27was fined $5973.00 dollars. Can't all these be bought at the local liquor store ? I usually bring grey goose in from duty free but have run out and bought more at the store on middle street. Hmmm I must be missing something here. Keep the drugs and fine the alcoholics ! Ummm maybe should be looking for all the big drug dealers instead. Last edited by Poppie; 07/09/14 06:17 AM.